At least since Athenian trade sanctions helped to spark the Peloponnesian War, economic coercion has been a prominent tool of foreign policy. In the modern era, sovereign states and multilateral institutions have imposed economic sanctions on dictatorial regimes or would-be nuclear powers as an alternative to waging war. They have conditioned offers of aid, loans, and debt relief on recipients’ willingness to implement market and governance reforms. Such methods interfere in freedom of trade and the internal affairs of sovereign states, yet are widely used as a means to advance human rights. But are they morally justifiable? Cécile Fabre’s Economic Statecraft: Human Rights, Sanctions, and Conditionality provides the first sustained response to that question. For millennia, philosophers have explored the ethics of war, but rarely the ethics of economic carrots and sticks. Yet the issues raised could hardly be more urgent. On what grounds can we justify sanctions, in light of the harms they inflict on civilians? If, as some argue, there is a human right to basic assistance, should donors be allowed to condition the provision of aid on recipients’ willingness to do their bidding? 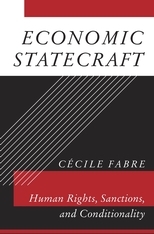 Drawing on human rights theories, theories of justifiable harm, and examples such as IMF lending practices and international sanctions on Russia and North Korea, Fabre offers a defense of economic statecraft in some of its guises. An empirically attuned work of philosophy, Economic Statecraft lays out a normative framework for an important tool of diplomacy.